You all know I love western themed items. From home decor to clothes, I love it all. 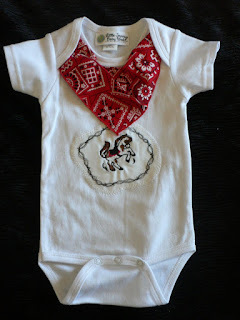 I recently discovered a wonderful line of western baby items from Little Journeys Baby World. They offer some of the most adorable country baby items I've ever seen. "Caroline Riepler the founder started her first business in 2001 handcrafting (Woodcarving) European Good Luck Witches, which she takes great pride in that Madeleine Albright the former Secretary of State of America has one of her limited editions. Soon after that in 2003 Caroline became pregnant with her son Stefan and Little Journeys Baby World was born. Unfortunately, things turned bad in 2004 when her Son, Aunt, two Dogs and herself got hit by a drunk driver. It took about 4 years to get back on track again into doing what she loves the most of being with her family and friends, traveling and her dream business Little Journeys Baby World." Check out this adorable onesis they sent me! It is really cute and I absolutely love the bandanna around the neck. I think it really makes the outfit. Imagine how adorable this would be with overalls or a cute pair of jeans! 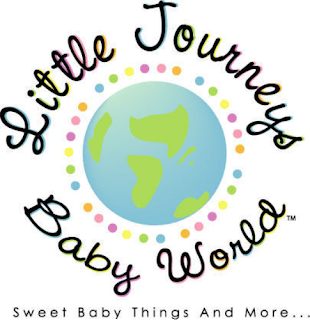 Little Journeys Baby World also has other great collections like their International, Traveling, and Heirloom lines. These custom made infant items would make fantastic gifts. They are high quality, absolutely adorable, and unique. Keep these wonderful items in mind when you are doing your holiday shopping this year. You can win one of the adorable Sheriff Onesis for yourself! Simply pop over to Little Journeys Baby World and look around. Then come back here and tell me your favorite item. This is mandatory for entry! One lucky reader will win a Sheriff Onesis in size 3 to 6 months. Deadline to enter is 12/24/09. This giveaway is open to US addresses only. Good luck! I love the Cowboy/Cowgirl Quilt. I also like the Cowboy/Cowgirl Quilt. The Tooth Fairy Pillows are also nice. I really like the Barnyard quilt. Thanks for the chance. My favorite is the Barnyard Quilt ! My niece just had a baby & her hubby is in Iraq ~I would gift this to her. They are all Texas Born & Breed......but normally are stationed in MO. She came down her(SOuthest Texas) to have they baby while Her hubby is overseas. I love the Lavender Sheep Soap!